Gluten sensitivity linked to: migraines, ischemic stroke, schizophrenia, epilepsia, and Lou Gehrig’s disease? Studies have found gluten sensitivity caused changes in the brain. Recent research on the problems related to gluten have focused on the impact it has on the brain. A recent study has suggested a link between gluten sensitivity and celiac disease with gastrointestinal discomfort (IBS) and migraines. Patients suffering from celiac disease have been found to have significant brain abnormalities as reflected on MR imaging (MRIs). (…) In some cases, the problem is simply a loss of brain matter. Researchers at John Hopkins University School of Medicine explored the impact of gastrointestinal redness (such as created by celiac disease) in schizophrenia. Gluten has been indicated in both ischemic stroke and blood clotting in the brain. In addition to headaches, brain abnormalities and blood clotting that may lead to stroke, gluten has been directly linked to epilectic seizures, and white (brain) matter lesions indicating ALS (Lou Gehrig’s disease). * The copyright holder of this work, release this work into the public domain. This applies worldwide. –The publishing of this image does not imply that the author endorse this article. 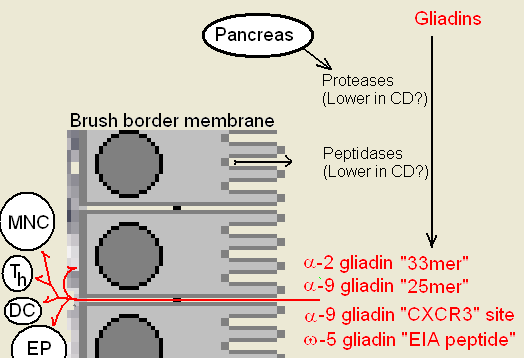 This entry was posted in Alternative Health, Education, Nutrition and tagged brain, gliadins, gluten sensitivity, immune response, inflammation, studies by cnlib. Bookmark the permalink.